THURSDAY. Whenever I get sick of my clothes, I head over to Mattias closet and steal something amazing, like this peacoat I “borrowed” the other day. It’s a bit too big on me, but paired with a belt it’s just the right kind of oversized! PEACOAT Uniqlo (stolen from Mattias). SWEATER Emerson Fry. BELT H&M. JEANS J Brand. HEELS Jimmy Choo (here). WATCH Michael Kors. This entry was posted in Outfit and tagged j brand, Jimmy Choo, peacoat by Carolina Engman. Bookmark the permalink. Absolutely amazing! Love this navy blue shade! Love a good boyfriend coat! This one is fab! 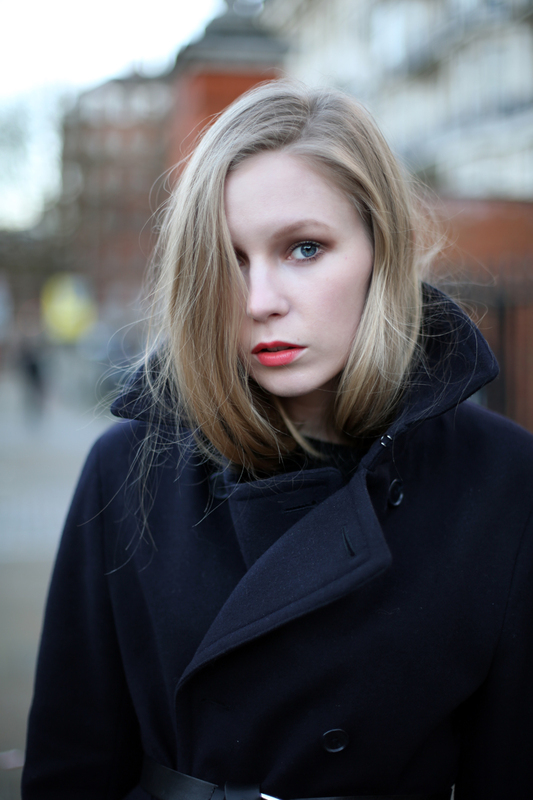 A classic peacoat will never go out of style. So in love with your heels! This outfit is so simple but so amazing! I love the way you wore your boyfriend’s coat and your perfect black heels! Besides, happy birthday to you (even though I’m a little late). I absolutely love that you paired a belt with the coat! That is such a great way to accessorize a look while giving yourself a figure in a boxy coat. The shoes in this post are also fantastic. 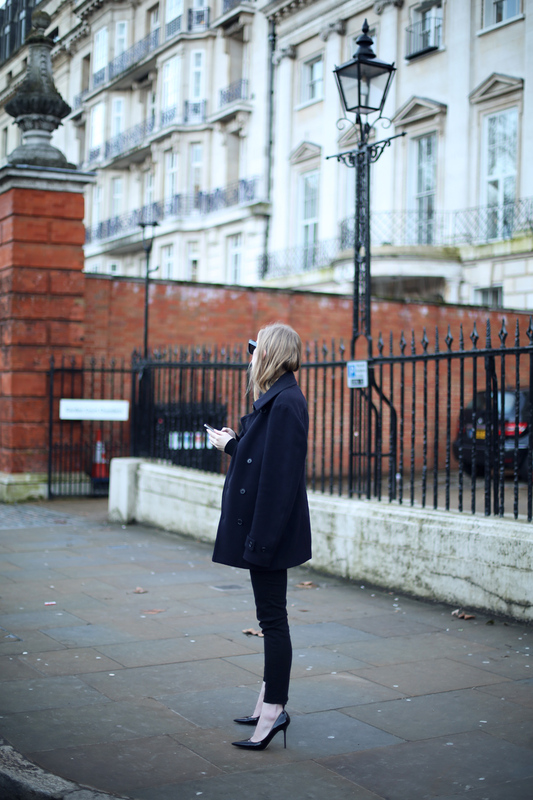 The navy coat is definitely a classic piece. so effortlessly chic, always. teach me your ways. write a book. Love how you have belted the coat! Love this look and the photos!! Love to be able to “borrow” things from bf closet lol! You look in credibly chic! This is a look I would totally dig and wear myself as well! Amazing look. The belt coat makes me think to Emmanuelle Alt, I love this idea ! Very elegant and simple, we like this color but we prefer spring colors and summer!!! Greaaaaat look! Love the oversized coat from your BF. With the belt it’s so nice! Really great and I love your make-up! You just proved how one can be completely fashionable without adding any colors. Matching the navy blue coat with the skinny jeans, the awesome Jimmy Choo heels and the simple accessories made it such an exceptionally stylish ensemble. You look so pretty! Love your lipstick! I love this outfit! you outfit is gorgeous! Love the coat! Chic but simple and elegant. 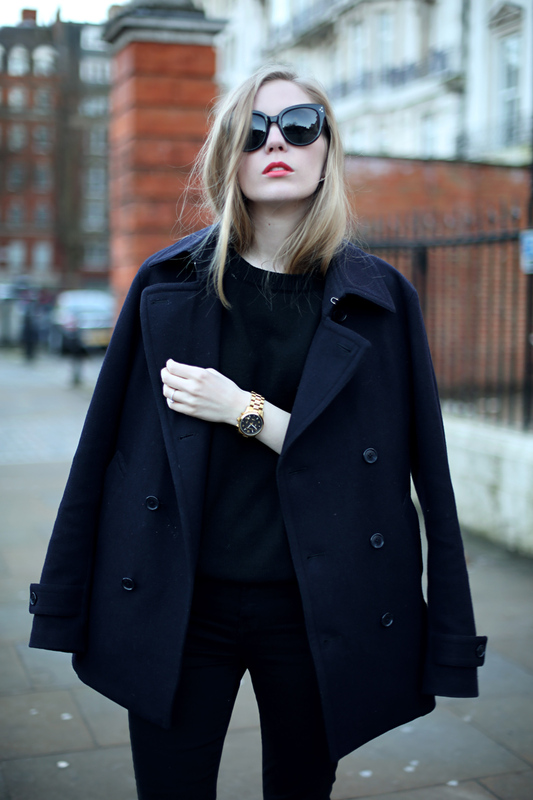 Beautiful coat and sunnies :)!! I love to wear man’s clothes, and this coat looks great on you! So so chic again! Love the look! Beautiful coat!!! It’s so chic belted and so relaxed draped over your shoulders! Just fabulous! Fabulous outfit, so classic and yet so current. Lovely outfit! I love the belt over the coat, I would’ve never thought of that! love it! my husband is too much bigger for me to be able to pull off something like this. This look just scream flawlessness, elegance and simplicity. Love it!!! Maravilloso el abrigo, como me gustan en este estilo. Great look I love all boyfriend wear! The belt saved your look! The idea of wearing boyfriend coat is just amazing. I love your pointy heels anyway. in love with your coat!!! You are amazing with the coat from your boyfriend! Love so much with the belt! Such an amazing outfit. In looking at it with the right look, the boyfriend wardrobe can be just as good as the own. Not bad, but I prefer the shoes! Love the coat all belted up. Love the coat with the belt, looks so chic! Love the look, it’s such a contrast of manly look vs the fine lines of a female body! That’s a great way to style a boyfriend coat. Awesome! I LOVE that lip color! Please tell me what it is. Pretty please? borrowing for the mister always makes for stylish looks! Beautiful outfit!! You look so pretty! love that lip color! who’s it from? would to put mu hands on it! Love this outfit, it’s so simple but chic. I love the way you style it with the belt. Cool! you look gorgeous! love the simpleness and the sleek feeling of it overall! So chic! love the coat! So chic as always! Now I feel like getting a men’s coat for myself! I like this black outfit ! So perfect !